The DA-12 earset mic from Da-CappoRecently we had the opportunity to test a few mics from Da-Cappo. I've been hearing more and more about them of late and was immediately interested in trying one out when my rep offered. We had two different models, the standard DA-12 and a shorter-boomed child's version. 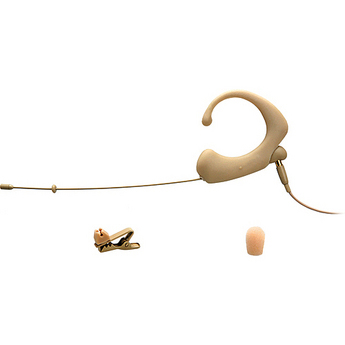 Normally we use the Countryman e6 for earset mics, so that was the point of reference in our system. In the past I've also used AT-892s and DPA 4088s, both of which sound better, in my opinion, than the ubiquitous e6. But I digress. The first use for the DA-12 was our Christmas Production, Gunch. We had a live narrator for much of the show who spoke into an AKG 414. That of course, delivered a smooth, rich sound. At the end of the play, the narrator needed to walk out on stage and wrap up the story. Thus, his voice needed to be similar to the 414. I chose to put the DA-12 on him and we were not disappointed. I won't say the DA-12 sounded exactly the same; it did, however, sound really close. With just a little EQ tweaking to warm it up, we had no trouble convincing the audience they were listening to the same person. The next test was to give it to our pastor for a few weeks. The first week he used it, was a little put off by it's design; under the ear rather than over, with a big silicone pad that fits behind the earlobe. After a week or two, he really liked it. In fact, when I had to give it back, the first weekend without it he said, "What happened to our normal mic?" He was bummed when I told him it was gone. He reported that it was very comfortable to wear, and it never barn-doored out as e6s are prone to do. Sound-wise, the mic sounds good. Really good, in fact. We noticed significantly less high frequency smearing than with the e6. We found ourselves using a lot less EQ to make our pastor sound like himself than we do with an e6. One thing we did notice, at least initially, was a tendency to get more breath pops and sounds with the longer-boomed regular DA-12. While the boom length is adjustable over a limited range, it doesn't stay pulled back very well. Since I had a child's length DA-12 CE sitting there as well, we tried that. It worked perfectly. No more breathy sounds and the small rubber ring around the boom kept the mic capsule from rubbing on his face. It's nice to have the ability to chose from different boom lengths for different-sized faces. The mic itself is built well and connects to the Kevlar reinforced cable by means of a threaded micro-connector. I like this a lot more than the connector on an e6. At the other end is another threaded micro-connector that mates with an adapter. There are a wide range of adapters available for all sorts of wireless transmitters. The upside is that it's great for rental houses to simply stock adapters to send out with gear. The downside for churches is that it adds about $80 to the cost of the mic. Speaking of cost, they run a little more than a regular e6 (by maybe $100 or so). Personally, I'd say they are worth it. The first weekend back on the e6 was a bit of a letdown. We we missed the DA-12. So why didn't I buy it? Honestly, I'm waiting for the single ear version of DPA's 4088 to come out. When it does, we'll try it out and see which one Pastor Ken prefers. Then we'll be buying one of them. The bottom line is that Da-Cappo has a solid product on their hands. I would have no problem recommending them to anyone looking for an upgrade from the e6.